Definitely got no idea what to cook for dinner just now. Opened the freezer, not much left in there as it's my groceries day tomorrow. The emptier the better, bcos I need the storage space for our 2 weeks supplies of halal produce. Anyway, I decided to make some chicken nuggets as there's a pack of chicken fillet and I'm missing McDonald's chicken nuggets at the same time. Not that I can't buy frozen halal ones, but they taste disgusting :( I wonder why the frozen nuggets are grayish in colour...yucks!!! 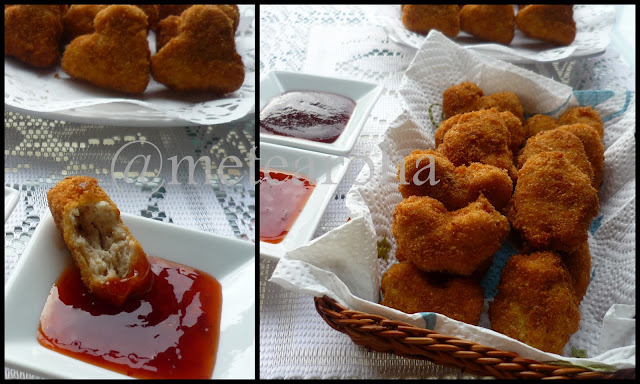 This nuggets recipe is so far the best that I've ever tried...will definitely use this recipe again next time. The softest chicken nuggets I've ever made, its definitely white just like McD's nuggets...the only thing that is missing is McD's curry sauce...and errmmm chicken beaks, heads, feathers, bon bon and any other parts that I can't think of...wahahahaz!! If using chicken breast fillet, cut into chunks and process in a food processor until fine. Otherwise skip this step. In a large bowl, transfer the processed minced chicken. Add the rest of the ingredients above and mix thoroughly. Shape the nuggets to your liking. Firstly, coat the nuggets with flour, then dip it in the beaten eggs and lastly coat it with breadcrumbs. Deep fry in hot oil until golden brown and serve with your favourite dipping sauce. this kinda stuff my kids suker, tak yah nasi main ratah menda nih ajer..this week rugi arr..xmas sat, dah memang tak keje..next week new year pun sama...feel like revamping my setotet let kitchen, lack of space nak letak barang..asyik beserak jer my dapur..
Isshhh mmg rugi arh this yr's punya stats day....my hb kena keje, jadi dia dptlah extra moolah. Takde dbl pay cuma 1.5 jer jadilah.